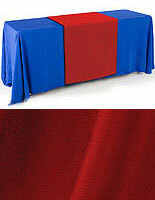 This extra wide red table runner is used to accent table covers within trade show presentations. 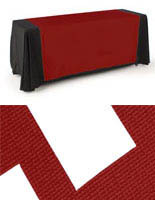 These table linens are made from red polyester fabric for a bright yet durable way to draw attention to a tabletop display. 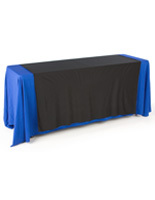 This table cover is 60" wide, making them perfect for use on 8-foot-long folding tables. 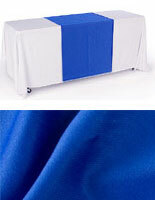 For a greater impact, feel free to add these inexpensive table runners on top of 6-foot-long tables! 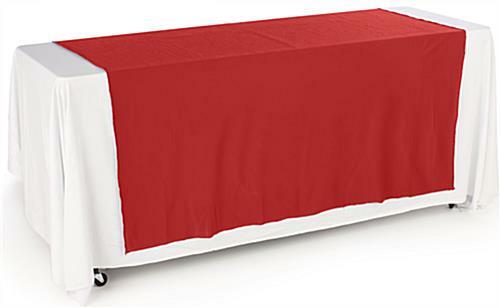 This polyester table runner will drape beautifully against most standard-sized folding tables with their 80" long design. 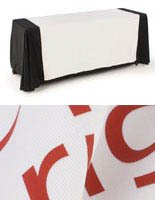 The red table runner will stand out against the standard table linens typically provided in either blue or black during a trade show event or convention. 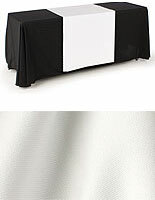 By using these plain table runners as is, you will be adding a splash of color to differentiate your display from competitors'. 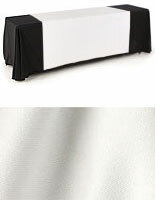 Display table runners can be used in various settings to add a unique element to a presentation. The size was more than expected, but great over all. The material thickness, edging and color is awesome. I would recommend this item to others.